Bucky Lasek took home his second Pro-tec Pool Party title in as many years before a capacity crowd Saturday night in a newly renovated Combi at the Vans Skatepark in Orange, CA. Bucky claimed $30,000 with former winners Rune Glifberg and Omar Hassan placing second and third in a deep Pro Division final that featured charges by youngsters including 15-year old Brazilian Pedro Barros, 17-year old Nolan Monroe and 18 year-old Josh Rodriguez. As big as Lasek's $30k win was, perhaps the story of the night was Steve Caballero snapping Chris Miller’s five-year streak as Master's champion. 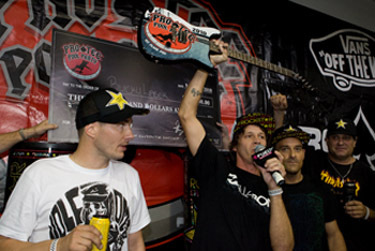 Miller electrified the crowd as he does each year in taking second while Lance Mountain took home third. Miller had captured the Master’s title the previous five years that the Vans Combi contest has been held. Those who missed the action live can find archives of the HD webcast at fuel.tv/poolparty.